Ian Rickson originally brought Jez Butterworth’s play to the Royal Court stage to award winning acclaim in 1995 and he returns the directorial chair for this revival, with a cast whose ensemble and timing are as slick as the Brylcreem in the dressing room. Butterworth’s dialogue is slick too, filled with a dark brooding menace enhanced with gloomy, claustrophobic sets by Ulzt and a pounding soundtrack from Stephen Warbeck and Simon Baker. Ezra, owner of the Atlantic Club in Soho, is an ever present but unseen character, whose efforts to prevent rival Mr Ross from poaching his star performer Silver Johnny result in his grizzly demise and he spends much of the second act represented by two dustbins downstage. Silver Johnny himself is brought explosively to life at curtain up by a Tom Rhys Harries. Harries disappears for most of act one, having been kidnapped by the opposition, and on his reappearance in act two he has a lot of hanging around to do before he springs back into manic action in the closing scenes. Fortunately Mr Harries has youth and apparent fitness on his side and hopefully won’t have too much need of the credited company osteopath - rather him than me though. The rest of the cast are a motley crew of club employees who are occupied through most of the play in trying to save both the club and their own necks from Joe Ross’s henchmen. Mickey, charismatically played by Brendan Coyle, is hopeful of taking over Ezra’s Atlantic but Potts (Daniel Mays) and Sweets (Rupert Grint) have a more realistic, if somewhat histrionic approach to the situation and the ensuing siege-like situation builds in ever-increasing tension leading to the final tragic conclusion. Mays is superb and special mention has to go to Rupert Grint who, in his professional stage debut here, seems to have risen spectacularly to the occasion. Some commentators have moaned of mumbling but I was seated in one of the most acoustically challenged areas of the theatre in the rear stalls and every word was delivered perfectly well for me. His character earns the nickname Sweets for providing the supply of pills that fuels the cast in their chemical highs and lows and adds other unexpected colour to their lives. This just leaves Baby and Skinny. Skinny is not the sharpest knife in the box and played with larger than life shambling and a good deal of comic charm by Colin Morgan. He appears to have a less than welcome fixation with Baby, Ezra’s wide-boy son, who in his strangely detached way deals with the bizarre events around him and the gruesome loss of his father. It is in his incandescent performance of Baby that Ben Whishaw all but steals the stage from his fellow cast, and I suspect he could easily walk away with the whole show if he had a mind to. This is a firecracker of a part and Whishaw clearly revels in it without ever overshadowing his colleagues. Mojo crackles with electricity throughout and its quickfire dialogue – often not for the delicate ear – rattles along relentlessly, keeping the pace moving throughout its substantial two and a half hour running time. This is a great anarchic antidote to the safe mainstream world of much of what’s on offer nearby in the West End. It should sell itself for its fine writing and gritty atmosphere as much as for the star rating of its high profile casting. 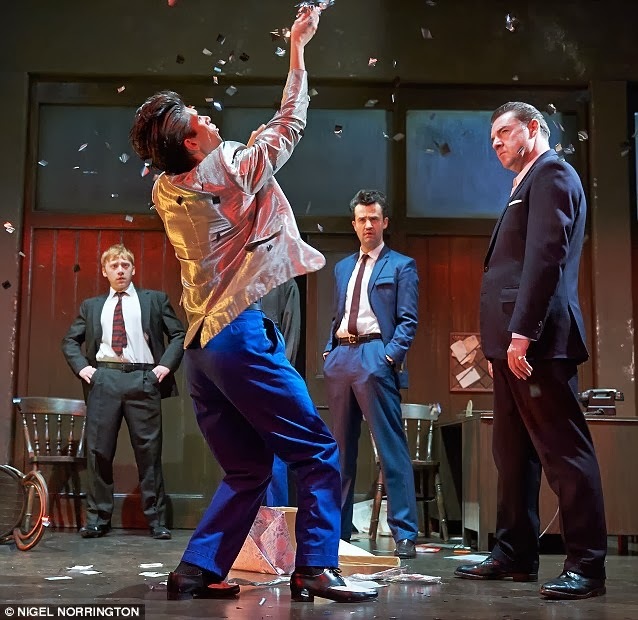 Mojo continues at the Harold Pinter Theatre Panton Street until 8th February 2014.